Why don’t you tell us more about relationship with the God behind the names? This website is an easily accessible tool to find basic information about the names of God in the Bible. Growing in relationship with God is certainly far more important than learning factual information, but it is beyond the scope of this site. 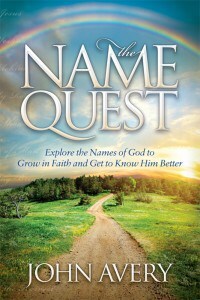 A soon-to-be-published book and the Bible devotional site Bible Maturity talk about growing in faith and relationship with God through the names. Why is the verse number in the image different from the Bible reference that you give? Sometimes the verse numbering of the Old Testament text is different from the English text. It is most common in the Psalms, Daniel, and some prophetic books. We have always provided the English reference. I know a little Hebrew and Greek. Some of the words in the photographs include different letters than in your transliteration. Why is that? Greek, Hebrew, and Aramaic words have different “forms” depending on their function in a sentence. For instance, the subject, object, and possessive forms of a word in Greek all have different endings. The transliterations on this site often show a simple form rather than the form used in the Greek sentence because the simple form makes more sense as a stand-alone word. What is a Strong’s number? Strong’s Concordance lists all the Hebrew, Aramaic, and Greek words found in the Bible. It assigns each word a number for easy reference. If you want to dig deeper the Strong’s numbers can help locate more information in Bible word books. I don’t see a name I am looking for. Why have you not included it? 2. Some popular names come from hymns or other Christian writings but do not appear in the Bible. This website only lists names and titles found in the Bible. 3. English Bible versions and paraphrases express the names of God in slightly different ways. While we tried to include the most common variants, it is impossible to mention them all. 4. The names are not well known in their Hebrew, Aramaic, and Greek originals. We chose a few of the most commonly recognized ones but could not include them all. 5. The line between descriptive names of God and mere descriptions of who He is and what He does is gray. “God is love” is a statement, not a name. We selected most of the names that appear in books about the names of God but omitted a few because they are really just descriptions. If you think we have missed an important name, please contact us.